This book explores the complex problem of how to measure the ‘success’ of social organisations, projects and activities. Whether improving a local situation, organizing a campaign around sustainability, or assessing the intangible effects of perceived social benefits, currently we have only have a very limited range of mechanisms for judging effectiveness. On the one hand, a market-driven logic demands that qualitative perceptions and experiences are quantified into simplified and numerically defined variables. On the other, community projects are left un-assessed, as one-off outcomes of local and situated processes that must somehow automatically ‘make things better’. For academics, researchers and other professionals working in this field this has resulted in the deep frustration of not being able to assess the things that are most centrally important: higher human values such as integrity, trust, respect, equality and social justice. 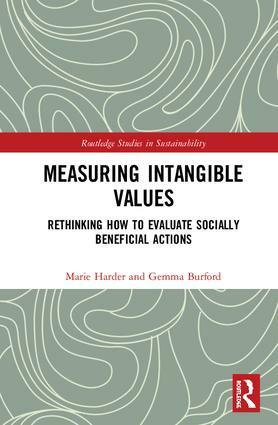 Measuring Intangible Values argues that we can make shared social values – and their measurement - central to decisions about improving civil society. But because these social values are intangible, we need to develop ways of eliciting and validating them at the local level that can capture people’s shared meanings across multiple goals and perspectives. We need to develop mechanisms for evaluating whether these values are met that use rigorous but also relevant measures. And we need to develop ways of doing this that are scalable, transferable and comparable across different kinds of organisations and fields of activity. This book will be valuable for researchers in all social science disciplines which touch on human values, such as sociology, social psychology, human geography, social policy, architecture and planning, design and community studies. Marie Harder is a China National Thousand Talents Professor at Fudan University, Shanghai, and the founder and head of the Values and Sustainability research group at the University of Brighton UK. Gemma Burford has been a Research Fellow in Sustainable Development at the University of Brighton, UK and previously worked in Tanzania as Founder and Co-Director of the NGO Aang Serian (‘House of Peace’).